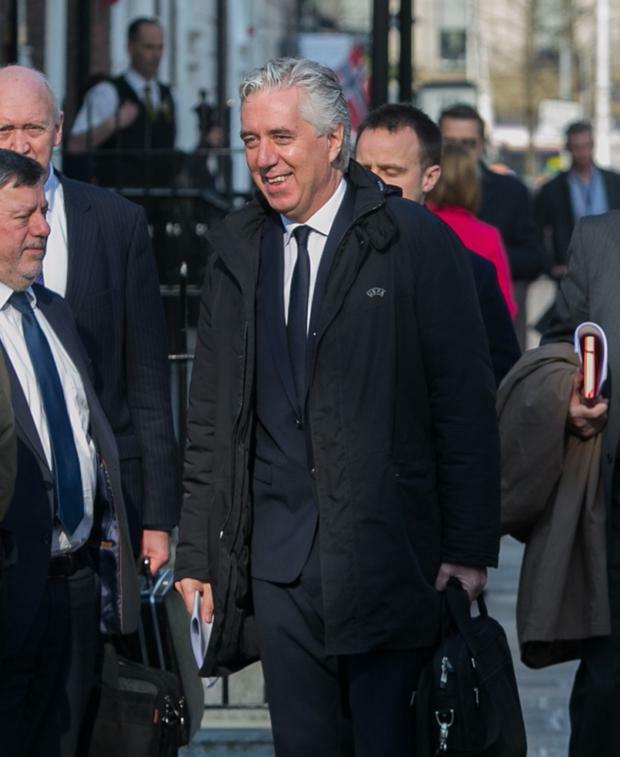 FORMER Football Association of Ireland chief executive John Delaney has told TDs that he is not in a position to answer questions on a controversial €100,000 payment he made to the organisation or its finances. In a statement Mr Delaney delivered to the committee today, he says he wishes the “overdraft” issue at the organisation had not arisen and be regrets the “embarrassment” it has caused. Mr Delaney gave an account of how the issue of the €100,000 payment arose, but said he can’t make further comments on legal advice. Mr Delaney’s statement was only been circulated to the Oireachtas Sport Committee this morning. Mr Delaney spoke after FAI president Donal Conway earlier told TDs that the former chief executive provided €100,000 to the FAI due to concern over a possible cash flow issue in 2017. Mr Delaney said he is “truly saddened” that Sport Ireland has announced they have temporarily withdrawn their funding. He gave an account of how the €100,000 payment he gave to the FAI in April 2017 that was paid back to him two months later. He said he was advised at an internal FAI finance meeting on April 25, 2017, that if all cheques and FAI bank transfers issued to third parties at that time were presented for payment, the FAI would exceed its €1.5m bank overdraft. He said he expressed “serious concern” and “surprise” as to how the FAI could have arrived at this position. He said the money was paid back on June 16, 2017. He said he recalled asking the director of finance Eamon Breen if the FAI had any reporting or disclosure obligations arising from the €100,000 payment. He said there was a board meeting on June 19, 2017 and the €100,000 payment did not arise. Social Democrats TD Catherine Murphy later asked Mr Delaney what the response was from the director of finance when he was asked if there were reporting obligations in relation to the payment. In his statement Delaney told TDs: “I accept that the overdraft limit issue arose on my watch as chief executive officer. His statement says the FAI has an excellent finance and administration team, staff and voluntary workers. Mr Delaney said he will fully assist the FAI in its engagement with Sport Ireland and Grant Thornton which is reviewing the Association’s records. He says he will do the same with Mazars and the Office of the Director of Corporate Enforcement in their respective inquiries. Mr Delaney statement also says: “On legal advice I am precluded from making any further comments at this hearing in relation to the finances of the Association or my former role as CEO or the €100,000 payment either directly or indirectly. “In the interests of fair procedures and natural justice, while I have made this statement to the Committee and have attended this meeting voluntarily… I am not in a position to answer any such questions here at this time”. He claimed that some members of the committee have made “highly prejudicial public pronouncements about me personally prior to my attendance”. He said he is happy to answer other questions relating to his current role as FAI executive vice president responsible for Uefa and Fifa matters. Earlier Mr Conway told TDs that Mr Delaney provided €100,000 to the organisation due to concern over a possible cashflow issue in 2017. Mr Conway said that there had a concern that if all cheques that had been issued by the Association at the end of April that year were cashed at the same time there was a likelihood of insufficient funds being available to cover all the cheques issued. He said this was a short-term issue as there was an expectation of funds coming to the Association from tickets sales, sponsorship and other sources. He added: “no contract or agreement was entered into between the Association and its then-chief executive officer. He said: “The board having been informed of the €100,000 payment further acknowledged that disclosure would be made in the necessary financial statements in accordance with the required accounting treatment and requirements of the Companies Act. “The Association has since embarked on a review of its internal control processes and procedures in order to ensure that a situation of this nature could will not arise again,” Mr Conway added. Mr Conway concluded his opening statement by saying that despite success on the pitch, the past few weeks has undoubtedly been a difficult time for Irish football and the FAI. He said he hopes the processes the organisation is putting in place will help restore faith in the Association. Committee chairman Fergus O’Dowd asked Mr Conway if the statement he made about the €100,000 transaction was from work carried out by consultancy firm Grant Thornton which is examining the FAI’s records. Mr Conway said the account he gave of the payment to the committee was “verified” by Grant Thornton. Mr O’Dowd asked if Grant Thornton’s full report would be provided to the Committee and Mr Conway said: “not at this stage”. The Fine Gael TD said that when evidence is introduced at the committee it’s “hugely important” to “back up what you’re saying” with the full report. The committee adjourned for 20 minutes as an opening statement from Mr Delaney – now the FAI’s executive vice president – was circulated to TDs.